Una is our principal Veterinary Surgeon with over 17 years experience in the field of Veterinary Medicine and she is passionate about her work. Una and her team ensure that each and every patient gets the very best veterinary treatment available. Our ethos at Vets Direct is that we want every animal that we meet to benefit from a positive experience with us, so that there is no fear or stress for them. The real benefit of a house visit is that the patient often does not know that the Vet is here! We endeavour to make the home visit as pleasant as possible for the pet so they will be happy to see us again at our next visit. 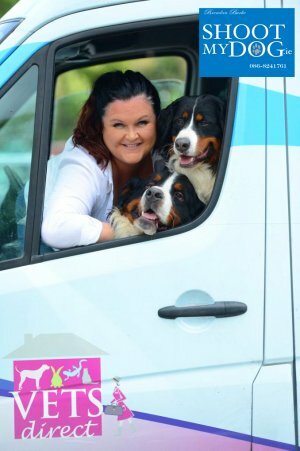 Una graduated with honours from the Veterinary College in UCD in 1997 and has worked extensively in the area of small animal medicine since then. She also holds honours Bachelor of Commerce Degree from UCD. From working as a resident in the University Veterinary Teaching hospital in UCD Belfield... to the DAEC (the 24 hour emergency hospital) ...to the referral hospital for exotic pets in Bray for 11 years ... to running the charity clinic Saint Francis Dispensary in Inchicore for 5 years . She has also worked in many of the Small Animal Clinics in Dublin including 5 years in Ark Vets in Dun Laoghaire and Foxrock. Una’s experience in the field of Small Animal medicine is vast. Vets Direct was born out of a need for a professional home visit Veterinary service for people’s pets. For many reasons people may be unable to get their pet to the veterinary clinic, so we come to them. Una also works at Dublin airport, clearing pets on arrival for entry into Ireland. Vets Direct are approved by the Department of Agriculture, Food and the Marine for this and are in partnership with Pets On Board a division of EFL freight international. As soon as the pet lands at Dublin Airport we do all the necessary checks for them in the Vets Direct Mobile Unit. We clear them thus allowing them to be reunited with their owner directly at the airport so the owner can take them home straight away. They no longer need to travel on to a veterinary clinic for further checks and delays. Many of the pets have had long journeys from Australia, Singapore, Brazil the USA so the sooner they are free to go home, the better for them and we are delighted to provide this service. Una and her team also offer fantastic packages to people wanting to take their pets abroad, for whatever length of time. Be it a family holiday to France or emigrating to South Africa. We provide the entire service, all under one roof. See our Pet relocation Service section for more details.